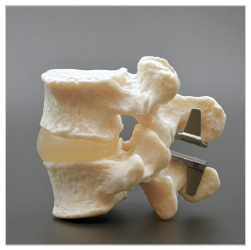 A Lumbar Interspinous or Interlaminar Spacer is an implant used to stabilize the spine following a decompression. In some cases, this technology is used in place of a traditional spinal fusion. This procedure commonly is used to treat a lumbar spinal stenosis and lumbar spondylolisthesis. At present, there are several different interspinous devices available. This intended to be a less invasive approach to stabilize the spine and maintain pressure off the spinal nerve while allowing natural motion. This procedure can be performed on an outpatient basis for many patients. A small incision will be made along the midline of your low back. Using specialized retractors, the surgeon will develop a plane through layers of muscle that will allow access to the affected area. Once the correct level is confirmed, using a high speed drill and cutting instruments,, small fragments of bone and ligament will be removed to uncover (decompress) the individual nerve root(s). Following the decompression, the surgeon will select the appropriate size interspinous or interlaminar device and place it along the backside of the spine. X-rays are used to confirm correct placement. Any muscles that were split at the beginning of the procedure are sewn back together and the skin is closed with either dissolving sutures or skin staples. The advantage of this less invasive approach is that it can alleviate radiating pain into the leg(s) while providing mechanical stability to minimize or prevent the development of instability without the need to fuse bones together. The device can easily be removed if necessary. This procedure can be performed on an outpatient basis for most patients. 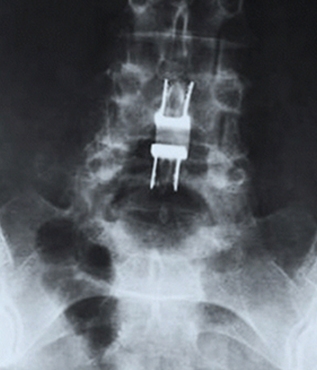 The interspinous devices are made up metal alloys consisting of mostly titanium, aluminum and vanadium. Your incision may be closed with either dissolving sutures or skin staples. A Silverlon will be placed over the incision. This dressing should remain on until the time of your first post-operative visit with Dr. Shim. If it begins to fall off, please contact the office. Staples will be removed approximately 12-14 days after surgery. If you have dissolving sutures, nothing will need to be removed. Since the device is made out of titanium, it is possible to set the detectors off. You will be provided with a card showing that you have a medical implant. You will need to present this during the security screening process.